Leo Tolstoy | Vorwärts und nicht vergessen! The great Russian novelist Leo Tolstoy was born as a landed count and aristocrat. After serving in the Crimean War, his sense of social justice began to surface and he worked with peasant schools. Tolstoy had a religious crisis in his forties, which, although it moved him from outright skepticism, caused him to denounce the powerful and corrupt Orthodox Church of Russia. Tolstoy called the church an „impenetrable forest of stupidity“ and a „conscious deception that serves as a means for one part of the people to govern the other,“ according to biographer Tikhon Polner. Tolstoy, in such books as Critique of Dogmatic Theology, wrote that Jesus Christ was human, not divine, rejected miracles and immortality. 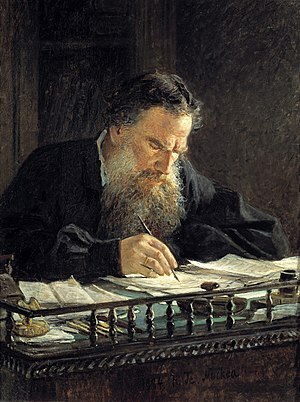 In My Confession (1882), Tolstoy wrote: „If there is no higher reason–and there is none–then my own reason must be the supreme judge of my life.“ The books were banned by church censors, and Tolstoy was called an „impious infidel.“ Tolstoy determined that his artistry must also have a moral purpose. From 1885 to 1895, he worked to make literature accessible to the masses and organized relief during famine. In 1895, he gave up his property, living as a nature-worshipping peasant, like his main protagonist in War and Peace. In that novel, Tolstoy wrote: „Freethinkers are those who are willing to use their minds without prejudice and without fearing to understand things that clash with their own customs, privileges or beliefs.“ As James A. Haught wrote in 2000 Years of Disbelief: „Many people who reject supernatural Christianity nonetheless embrace Christ’s message of compassion. Tolstoy carried this pattern to an extreme. He renounced organized religion and was excommunicated by the Russian Orthodox Church–yet he became almost a monk, living in service to others.“ Tolstoy was excommunicated by the Holy Synod of the Orthodox Church in 1901. He belonged to no sect, while espousing an ethical Christianity. In What Is Religion? (1902), Tolstoy wrote: „One may say with one’s lips: ‚I believe that God is one, and also three‘–but no one can believe it, because the words have no sense.“ D. 1910.